Those who spend extended amounts of time on the computer would also be wise to note another factor that often contributes to computer related discomfort and may even be potentially sight-threatening: blue light. This high-energy light comes from computer screens, televisions and smartphones, and has been known to cause eyestrain, headaches and fatigue. 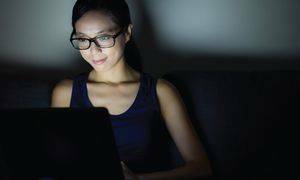 Recent studies also point to growing evidence that blue light exposure has the potential to significantly increase a person's risk of macular degeneration over time. For more information about how computer glasses can help you, speak to your Tulepo eye doctor today. Be sure to buy glasses that fit your face shape! Your Tulepo eye center team will help!